This image came to me on a recent trip to Bali. Sitting on the beach one morning, I realized that the reason I felt so at peace was that by being distracted by so much beauty, I had relaxed the grip my brain usually has on trying to solve undesirable circumstances in my life. Problems I could never resolve in an anxiety ridden state of mind. So the symbolism represents the negotiation between the ego and the higher self (or God’s will, if you prefer). The nature of the ego is to attempt to force an outcome it can’t fully control, as represented here by the hard, unyielding stones. 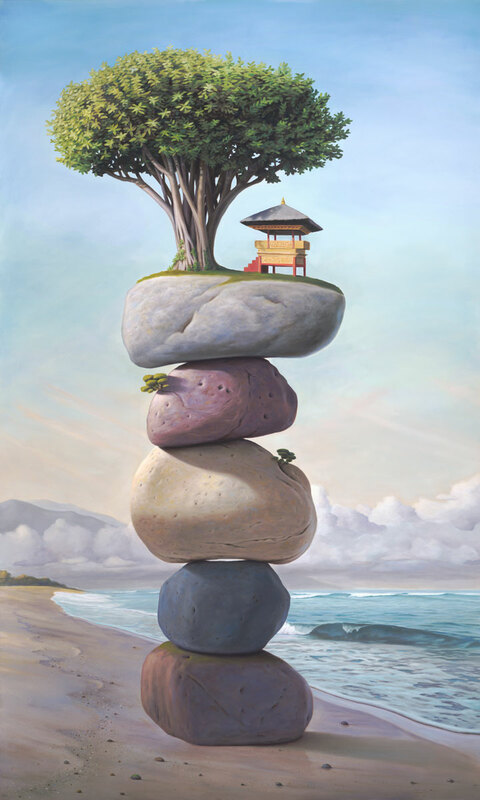 However, only the higher self with its far seeing vantage point has the ability to orchestrate unimaginable circumstances to a usually even more positive resolution, as symbolized by the fantastically balanced tower and perched temple. So, on that soft morning, I remembered to trust in this grander perspective and heightened ability that we all have at our disposal. The issue was soon delightfully resolved, thank you very much.